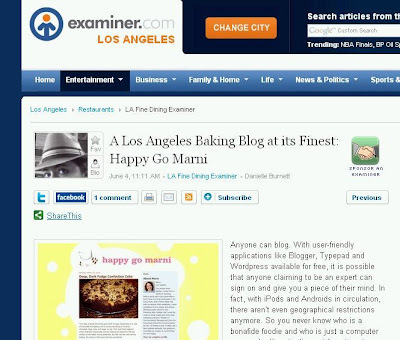 I'm Profiled in The LA Examiner! Winnie - Thank you so much! That's a great article - congrats! I have 50+ cookbooks and thought THAT was a lot. Haha, clearly I was mistaken. That is great!! Congratulations on the article. Congrats, Marni! Very cool profile. Keep cross-posting your publicity so we can continue to follow along! A big pat on the back to you, Marni! You deserve all the kudos that come your way, as you're one of the sweetest, most down-to-earth bloggers around. Congrats!